The new Microsoft Surface Pen is better and faster than ever, with precision ink on one end and a rubber eraser on the other. 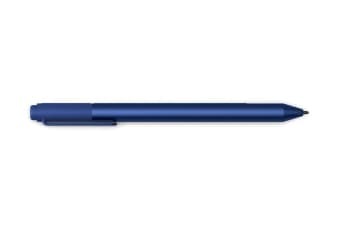 The Microsoft Surface Pen also has tilt functionality for shading, greater sensitivity and virtually no lag. Windows and Office give Surface Pen more power than ever. Strikethrough words to delete, circle text to select, highlight using Ink Editor and even replay the sequence of mark-ups from others. Taking and managing notes with OneNote is easier than ever. Do homework, replay notes to better remember your thoughts and write out math equations that solve themselves using Ink Math Assistant, all in one place. Streamline editing documents with digital inking. Use your Surface Pen to annotate and highlight text and the built-in digital ruler to set things straight. Sketch, shade and paint with artistic precision and finer control with 1,024 pressure points that respond to the lightest touch. Effortlessly express the finest sketches and lines with Surface Pen. Rest your hand on the screen of your Surface device, just as you would write on a notebook. Watch Surface Pen in action with help from Microsoft app partners and discover completely new ways to bring your ideas to life. Enjoy amazing inking experiences on your Surface with the Surface Pen and the latest apps that now support tilt for artistic shading. The Surface Pen is compatible with Surface Pro, Surface Pro 4, Surface Pro 3, Surface Laptop, Surface Studio and Surface Book.